Although we do have some simple joining tools for working with light-weight mouldings for small frames, the tools featured below offer a range taking you from simple beginnings to professional kit. Do remember that for very best mitre joins, you first need to have made accurate, clean mitre cuts. GENERAL: This is a sturdily built corner joiner. It has all the features needed for accurate joints, allowing you to clamp and join mouldings working on a corner at a time. You can work easily on hard or soft wood mouldings of all varieties up to a width of 2.5”. Although a simple piece of kit the end results can be as good as top range underpinners. SPACE: Can be used as a table top kit, easy to pack away after use. USER: Will suit people with small workshop space but wanting to produce good quality framing on a budget. A great starting point for framing and will remain useful even if you upgrade later. ADVANTAGES: Can produce any size frame. You work on a corner at a time, so for large frames clear a floor space: the only limit is the door size you have to take the frame though! LIMITATIONS: Time is the only possible issue – if you have to produce a load of frames it will take you longer than some other machines but you still have complete control over the quality. GENERAL: The first machine with a built in clamp. Moulding lengths are held in place and pushed onto a cartridge holding 2 v-nails: one towards the back of the moulding; the second you position towards the sight edge. Fully adjustable positioning of the pinning handle ensures perfect placement and full compression. USER: Will suit people with small workshop space but wanting to produce good quality framing with speed and consistency. ADVANTAGES: Can work quickly with a wide range of mouldings – frames really fly out of the workshop. It also allows you to double bank v-nails (one on top of another) because of the cartridge making joints in deep rebate moulding especially good. LIMITATIONS: Less easy to operate with very large lengths of moulding (700 mm+) especially heavy timbers such as oak / ash. GENERAL: It has all the essential features of professional underpinners but at a much more affordable price. It has an adjustable top clamp to keep corners in place when v-nails are pushed in from underneath the support table, using a foot pedal. This leaves your hands free to hold moulding lengths in place, assisted by extension tables included in the kit. SPACE: Floor standing, but will fit neatly into a corner of a room / workspace. Needs some space around for the moulding lengths you are working on. A light machine so it does not have to be relegated to the outdoor workshop. USER: Will suit people with small workshop space, working on regular amounts of framing but not necessarily large volumes. Especially good for those framing larger pieces of work. ADVANTAGES: Can work quickly with a wide range of moulding. 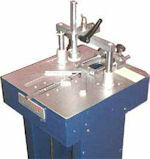 Its foot pedal operation, to insert wedges, leaves hands free to work easily with large framing. Good corner and overhead clamping gives great support when pinning. Excellent price. LIMITATIONS: V-nails have to be placed into the holder, individually, ready for each “firing”. PRICE: £200.00 + vat (May ’09). GENERAL: This new British designed underpinner is very simple to use thanks to its advanced features. It is a professional framing tool at affordable prices. Using the sliding fence you can set front and back limit stops keeping wedge positions accurately placed for each join. When using tall mouldings the fence can be locked in position to allow wedges to be stacked two on top of each other, therefore two 10mm wedges become a 20mm wedge. There are two foot pedals. 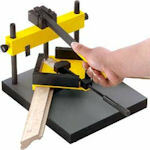 The right hand one operates the moulding rebate clamp which securely grips the moulding from the front before pinning. The second pedal inserts the v-nail. A light indicates when the v-nail has been inserted successfully. Another great feature on this machine is that when adjusting the fence, to insert a second wedge, the rebate clamp also travels with it, so that the moulding always remains tightly clamped. SPACE: Floor standing and quite solid – doesn’t have a massive “footprint” but not the machine for constantly moving around. Again slotting into a corner saves space. USER: Will suit those of you regularly working on larger frames and / or in larger quantities with suitable workshop space to leave this bit of kit in place. Ideal starting point for earning money from framing or where framing is a becoming a service offered within an existing business. Great for amateur framers too who take their hobby seriously. ADVANTAGES: Can work quickly with a wide range of moulding. All the bonuses of professional kit but at an affordable price. Some unique and useful design features: dual pedals; support “tables” bolted on; indicator light. LIMITATIONS: With its recent upgrades none easily spring to mind. PRICE: £371.47 + vat (May ’09). GENERAL:This is a professional, quality underpinner. It is quickly adjustable for different widths and heights of mouldings. The top pressure pad is L-shaped steel with a hard felt pad, held in place magnetically to allow you to adjust it to the ideal position relative to the moulding profile. It has a horizontal rebate clamp to pull the moulding firmly whilst it is being joined. It uses Alfagraf 'Power-Twist' wedges which draw the moulding together as they are inserted. 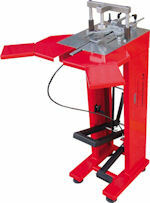 The insertion hammer, operated by a foot pedal, is solid steel and is guaranteed for two years. The 'Alpha 1/M Super' takes mouldings from 6mm to 80mm wide. SPACE: Floor standing and very solid – also doesn’t have a massive “footprint” but not the machine for constantly moving around. Again slotting into a corner saves space. USER: Will suit those who want to have the confidence to take on any size and style of work. If you enjoy using great quality kit, are looking at regular or high volumes this copes with anything. ADVANTAGES: Great build quality, solid, dependable and easy to operate. Because it is not overcomplicated in design, it allows you to make adjustments easily so you should always get the very best quality finish on your frames. 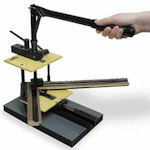 It is a real “work-horse” and allows you to function as a professional framer. But you do get what you pay for! LIMITATIONS: No limitations in its use. However, if budget is very tight then it might just be a step too far. But you do get what you pay for! PRICE: £695.00 + vat (May ’09).